A campervan is without a doubt the best way to see the wonder and beauty of the New Zealand countryside. Tackling a motorhome for the first time can be quite an unnerving experience, but you will soon find that once you get behind the wheel it will become like second nature. 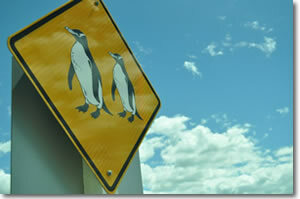 Many foreign travellers are also a little apprehensive about driving on New Zealand roads. If you have driven in Australia before, the rules are almost exactly the same. For visitors completely new to these systems of roads, the most important thing to remember is to keep to the left side of the road. As confusing as this may be to drive on the “wrong” side of the road, you will get used to it almost immediately. Another important (and slightly confusing) rule to keep in mind is that you must give way to all traffic crossing or approaching from the right. This includes when you are turning left at the same time traffic on your right are ... you must let them turn first. You must also remember to carry your current driver's license or International Driving Permit with you at all times. These documents must be current and if they are not in English, they must be accompanied with a translation. There aren’t too many police on the roads, but you don’t want to take the risk! The roads in New Zealand are generally very easy to drive on and are well-sealed. 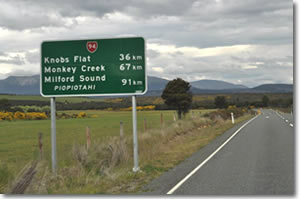 Many parts of the countryside (particularly on the South Island) have very windy roads, which are best taken slowly. Low gears are also recommended for steep roads, and should be utilized when ascending and descending mountainous terrain. Well-signed roads make navigating your way around easy, but it still pays to know what the road signs mean. Speaking of road signs, there is also somewhat of a lack of merging signs, particularly in the city areas. Therefore you need to be alert at all times to ensure you are prepared for a lane to end. Staying alert is incredibly important, so get plenty of rest before driving big stretches in New Zealand. Share the driving if possible and remember to stop for a break every two hours. Distances between destinations can be vast, so ensure you plan out your journey beforehand. Distances between petrol stations are also immense, so fill up as often as possible and try not to let your fuel tank ever get too much below half-full. Some of the roads here are also shared by the local animals. Signs indicate whether wildlife crosses the road, while sheep and cattle herding is also a common occurrence in many parts of the country. However plenty of notice is given for these, so just take careful notice of the signs. Driving on New Zealand roads can be a wonderful experience. The scenery that lies beside the roadside will simply take your breath away and will make driving here an enjoyable experience. And the best part is that your campervan will give you the time and freedom to explore it all. So what are you waiting for? Book your motorhome now and start discovering why New Zealand is such an incredible holiday destination today!